[Editor’s Note: Nadia Kashem is a first-year law student at Fordham University School of Law and former architectural student of The Spitzer School of Architecture at The City College of New York]. “Imitation is the sincerest of flattery,” Charles Caleb Colton once wrote. 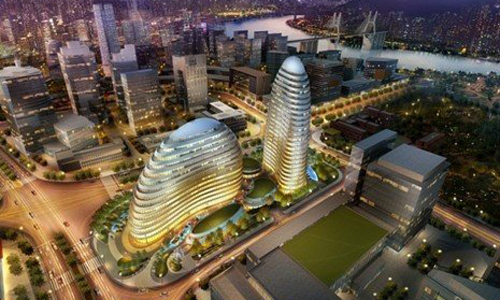 For Zaha Hadid, this flattery came in the form of the Meiquan 22nd Century building in Chongqing, China. The artist at the center of the following 2012 legal controversy is not conventional. Hadid is a sculptor of sorts, but she does not build out of clay. The parametric sculptures she designs are intricate glass, concrete, and steel enclosures that are conceived on her computer and then brought to life in major cities around the world. In 2004, she became the first female architect to receive the Pritzker Prize, the most-coveted award in architecture. Despite her international prominence, however, one of her recent buildings in China was not immune to piracy. Both projects are designed around a park-like complex cut by a series of paths. Each contains smooth curvilinear towers sitting asymmetrically on the site, facing different views of the respective cities. With the exception of the Wangjing SOHO having three towers compared to the Meiquan 22nd Century’s two, the projects look eerily similar. Although counterfeit merchandise and forged artwork are already abundant in China, it is especially eerie to know that a building—something to which an architect can dedicate years of her life,—can simply be copy-and-pasted elsewhere, emphasizes a substantial challenge that artists can face in the computer age. Architecture students learn that a building’s shape is uniquely developed through consideration for a series of factors, such as program distribution, solar studies for natural light, pedestrian flow patterns, vantage points, and circulation, among others. Therefore, no two buildings in the world can ever be exactly alike without someone recycling another’s design. An innovative approach would be to deconstruct the ideas that went into the admired design and reassemble the “sculpture” using those factors, but configured to the new site. Then the architectural concept would be the same, but the characteristics of the two buildings would be unique to their own site conditions. Here, the buildings were virtually identical, save for a few tweaks. That just does not happen out of sheer coincidence. An issue, however, might emerge if one were to use this reasoning to justify copying another architect’s work. If the concepts are different despite the physical resemblance, has there really been an infringement? Satoshi Ohashi, the project director at Zaha Hadid Architects, certainly thought so. He was unconvinced by Chongqing Meiquan’s insistence that the concept behind the Meiquan 22nd Century was unique. Instead, he suggested that renderings or technical drawings—based off of a 3D computer model of the Wangjing SOHO—might have been electronically accessed by the Chinese developer, and then used to design the copycat building. Should Zaha Hadid Architects have decided to sue in China, the London-based architecture firm would have likely prevailed on a copyright infringement claim against the pirate developer, because of a similar precedent that had been decided only four years prior. In Dr. Ing. h.c. F. Porsche AG v. Beijing Techart Auto Sales Co., Ltd. the German automobile manufacturer Porsche, which was the original copyright owner, sued the defendant for imitating its building design. The Beijing Municipal High People’s Court held that architectural works fall under China’s Copyright Law and that construction can be considered a method of copyright infringement, for which there is civil liability. However, the court also held that the remedy for such cases would be to order the infringing party to reconstruct the building rather than to demolish it, for economic efficiency. Thus, it is only a limited victory for wronged parties. 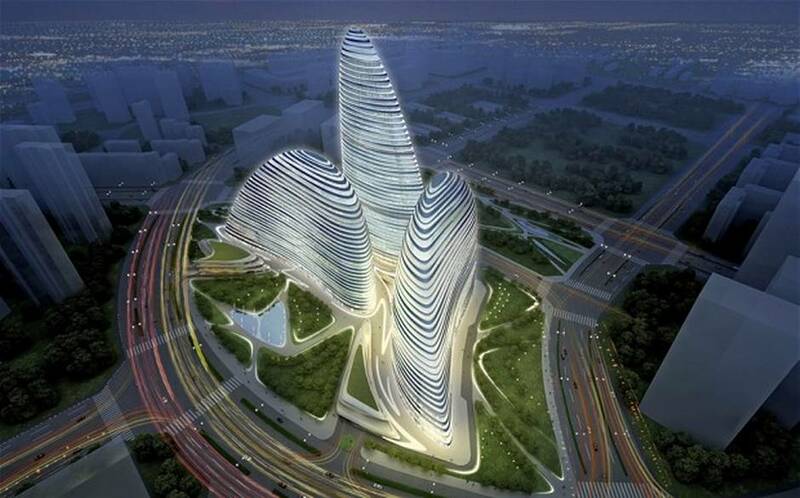 In the matter of the Meiquan 22nd Century structure, after representatives from the rival companies held a press conference in May 2012, SOHO China, the developer of Hadid’s project, stated that it intended to file a lawsuit, alleging copyright infringement. Hadid’s lawyer also requested the developer to cease construction and demanded compensation. At the very least, a demand was made to change the façade of the Meiquan 22nd Century. However, Zaha Hadid Architects was under pressure to get the Wangjing SOHO completed before the other company, meaning that litigation would have been yet another obstacle when time was already limited. Perhaps this is why no case ever came to court and the media attention given to the controversy eventually dissipated after the completion of the Wangjing SOHO in 2014. The Meiquan 22nd Century is still under construction. “Never meant to copy, only want to surpass.” This is the new slogan Chongqing Meiquan made on its Sina Weibo microblog at the time in response to this controversy. Chinese IP law is certainly evolving to protect architects’ rights, but perhaps it should implement stricter punitive measures, such as revoking the licenses of developers and architects who seek to similarly “surpass” others’ designs. Many foreign architectural firms, like Hadid’s, have contributed to the country’s building boom, and many more can be expected to do so in the years to come. C. C. Colton, Lacon: Or Many Things In Few Words; Addressed To Those Who Think 114 (8th ed. 1824). Marcus Fairs, Zaha Hadid Building Pirated in China, Dezeen Mag. (Jan. 2, 2013), http://www.dezeen.com/2013/01/02/zaha-hadid-building-pirated-in-china. ZAHA HADID ARCHITECTS, http://www.zaha-hadid.com/architecture/wangjing-soho (last visited Oct. 18, 2015). Jessie Chen, Twin Buildings Appeared in Beijing and Chongqing, CHINA IP MAG. (Sept. 6, 2012), http://www.chinaipmagazine.com/en/journal-show.asp?id=859. Paul Toscano, 10 Business Fakes Made in China, CNBC (Aug. 2, 2011), http://www.cnbc.com/2011/08/02/10-Business-Fakes-Made-in-China.html?slide=1. Nicola Davison, Chinese Librarian Replaced 140 Masters Paintings with Works He Painted Himself, Telegraph (Jul. 21, 2015), http://www.telegraph.co.uk/news/worldnews/asia/china/11753020/Chinese-librarian-replaced-140-masters-paintings-with-works-he-painted-himself.html. Paul Crowthew, Phenomenologies Of Art and Vision: A Post-Analytic Turn 31 (1st ed. 2013). Kevin Holden Platt, Zaha Hadid vs. the Pirates: Copycat Architects in China Take Aim at the Stars, Der Spiegel (Dec. 28, 2012), http://www.spiegel.de/international/zeitgeist/pirated-copy-of-design-by-star-architect-hadid-being-built-in-china-a-874390.html. Dr. Ing. h.c. F. Porsche AG v. Beijing Techart Auto Sales Co., Ltd., Beijing Mun. High People’s Ct., CLI.C.874263 (2008). Dr. Ing. h.c. F. Porsche AG v. Beijing Techart Auto Sales Co., Ltd., (Beijing Mun. High People’s Ct. 2008), CLI.C.874263(EN) (Lawinfochina). Xing Yihang, Copying Architecture, CHINA RADIO INT’L. (Jan. 14, 2013, 8:35:47 PM), http://english.cri.cn/6909/2013/01/14/2724s743500.htm. This entry was posted in 2015, Fall and tagged architecture, China, copyright.